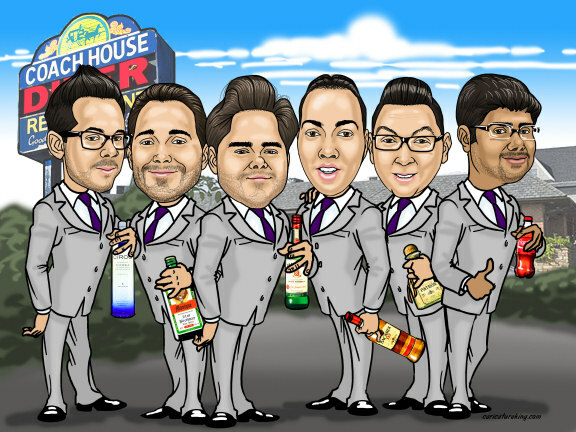 A caricature is a fantastic groomsmen gift idea and also a bridesmaids gift idea for for upcoming wedding. It is the perfect thank-you gift for those groomsmen who helped the groom before and on the wedding day and a present that will keep the memory of the day alive. The customization possible with a caricature as an idea for a groomsmen gift allows for the personal attributes of the groom and groomsmen to be easily incorporated. Another reason a caricature is highly suitable groomsmen gift idea is each groomsman can get their own copy of it not almost no additional cost. With advanced planning heads and shoulders of each can be isolated and given separately (most artists). We can create a great group caricature for your groomsmen gift using separate images – in any scene or posing arrangement you want. It could be something relatively straightforward as in this sample below, or something totally wacky…we can draw it! This example by artist Luis (see more). The groomsmen, each with their favorite drink and the wedding location. A fun groomsmen gift.